Firestorm searches the oceans floor, with the help of Doctor Palmer, for a few molecules here and there of their missing friend Plastic Man. Plastic Man has been trapped in his own delusional, seizure-ridden, mind for the last 3000 years since he was lost in the past. Once his bits and pieces are transported back up to the Watchtower he begins to self heal. 3000 years trapped as little more then crumbs and Plastic Man continues to survive, everyone is amazed. Meanwhile, the "New" League members are moving out, most of them anyway. Hawk Girl and Green Arrow are on their way back to earth and say their goodbyes to Faith who has chosen to remain. Batman sees Nightwing to the transporter and offers him words of encouragement while Nightwing offers some advice to the resurrected Batman, "Spend Time with the living." Just then Wonder Woman runs into Batman. On an uninhabited moon orbiting Jupiter, Green Lantern and the Flash are blowing off steam with their super powers when Kyle drops a bomb shell: He's taking a sabbatical from the League. His replacement will be former Green Lantern Jon Stewart. Kyle is disillusioned with the people he's sworn to protect and he just has to run away for a while. The Shaman and his wife play in the holographic chambers of the Watchtower reflecting on the gifts this new world offers them when Jason Blood floats in on a cloud of smoke. He has a few nuggets of information to pass on to the next resident magician of the JLA. Batman and Wonder Woman awkwardly stand with one another in a tiny hallway aboard the Watchtower. They should talk, they should express their feelings over a last desperate shared kiss, they should tell one another how they feel. However, Arthur arrives from Atlantis and effectively ends their nonexistent conversation. Arthur arrives with a pair of royal guards with their weapons trained on him. When the JLA realize he's been placed under arrest they leap into action. Arthur's calm hand steadies them, he explains that what he's done to his people and their suffering during the Obsidian Age is his fault, and he must face the consequences. He bids them farewell and teleports back to his fate. Back in the lab Plastic Man has woken up and is more then surprised to see Major Disaster watching over him and attacks the new Leaguer. Once he is calmed down Plastic Man sits everyone down and explains to them that the last three thousand years have felt like hell and it drove him to the brink a number of times. But during the duration of his exile all he could think about was his son, the son he never got to know. The League is shocked to find that Plastic Man has a son, but they are more then understanding when he reveals that he'll be leaving the League and the hero business for a time to get to know his kid. Later in the observation deck of the Watchtower, Clark stops in to see a meditating Martian Manhunter. J'onn is upset, he blames himself for the League's death in the Obsidian Age. If not for his uncontrollable fear and weakness to fire the League would have survived. J'onn has decided he must leave the League for a time in order to overcome his weakness, and he will return only then. The Martian Manhunter flies off into space leaving the stoic Man of Steel gazing out the observation deck window. Before he has a chance to reflect or absorb the JLA alarms go off. It's time for the world's greatest heroes to leap into battle. Story - 4: I'm sure many people are going to be up in arms about League main stays like Martian Manhunter and Kyle Rayner leaving the JLA. However, I think that they will be as gone as Batman was following the "Tower of Babel" arc. That is to say they will still be featured in the book, but not as official team members. The new line up allows for Joe Kelly to play around with character development and interaction more. Heroes like Faith and the Shaman are his exclusively to play around with, while Jon Stewart is a second string character that he can be more flexible with then Kyle, and lets not forget he already has a controlling voice in the Superman books. I was put off by how nonchalant everyone is dealing with their return from the dead. After such a serious matter one would think it would take a little more then psychic counseling from J'onn to cure all your problems. Plastic Man's return to sanity, or what passes for his form of sanity, seemed to come a bit too easy as well. 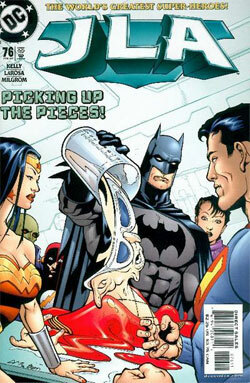 However, such things as Wonder Woman and Batman's lack-of-conversation was handled perfectly. An emotional confrontation between two stoic people and the difficulties inherent in that. Over all it was a nice follow up to a story as bombastic as The Obsidian Age, and I'm impressed to see that they dedicated a whole issue (without battles and super villains) to picking up the pieces. Art - 2: This art is all over the place. The first pages featuring Fire Storm are good stuff, as well as the fantasy scenes in Plastic Man's mind. But then the page featuring the Shaman looks like an odd cubist painting. It almost looks like three different pencillers worked on this book. Cover Art - 4: It's representative of the issue, well drawn, features a background (although it maybe bland). Everyone on the cover except for the Flash, don't seem very surprised to see Plastic Man in his helpless condition, which is a bit wrong.